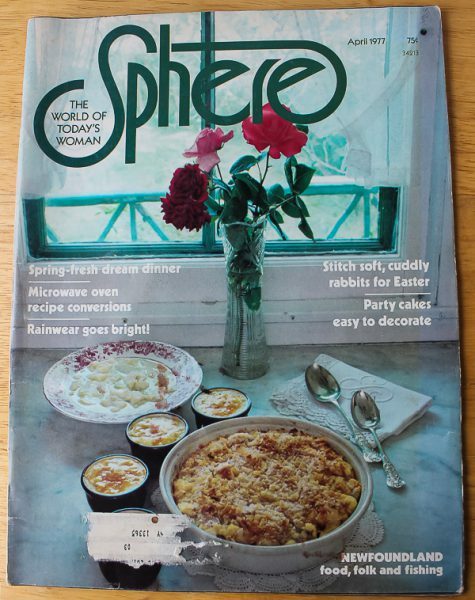 This issue of vintage Sphere magazine from 1977 was filled with all kinds of recipes for preparing fish. One full-page included a cooking lesson from one of my favorite cookbook authors, Bert Greene, for Poached Fillets of Sole, a visually beautiful dish with delicate fresh flavors including chives, dill, parsley, lemons, and white wine. The dish was part of a dinner menu from M.F.K. Fisher which also included asparagus in lemon butter and a green salad. Dessert was strawberries with double cream and butter pecan cookies. Another article was all about preparing fish caught fresh from Newfoundland shores, especially cod. There was a codfish recipe that sounded so good and easy and what I chose to make for you. The cod is first cooked, then flaked into chunks for an easy casserole. 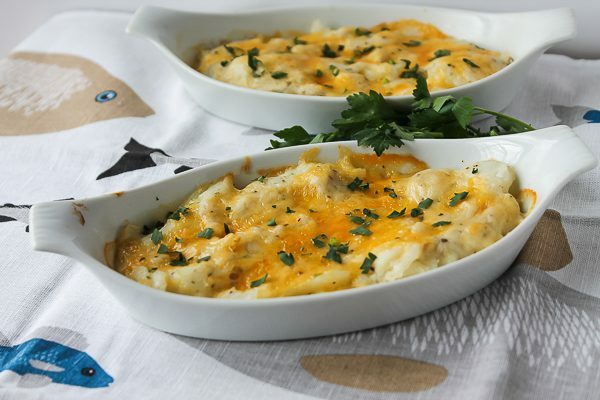 A white sauce with dried savory (or dried marjoram, my choice) is poured over the cooked fish, sprinkled with some sharp cheddar cheese, and baked. So easy! We really enjoyed it, served with some lemon orzo and sautéed zucchini slices. It was a great meal ready in under an hour. Cod cooks very quickly, but gets watery, which is why it is cooked and drained before baking it into a casserole. I would make this again for sure! And since it is April and time for Easter, there is a pattern included in the back of the magazine to make the cutest little momma bunny and her litter. If I could sew, I would make these for my granddaughters, but unfortunately I did not get the sewing gene from my mom, who could sew anything. So instead, I cook! Heat oven to 350 degrees F. Butter a 1-1/2 quart baking dish; set aside. )Or you can use 6 gratin dishes for individual servings). 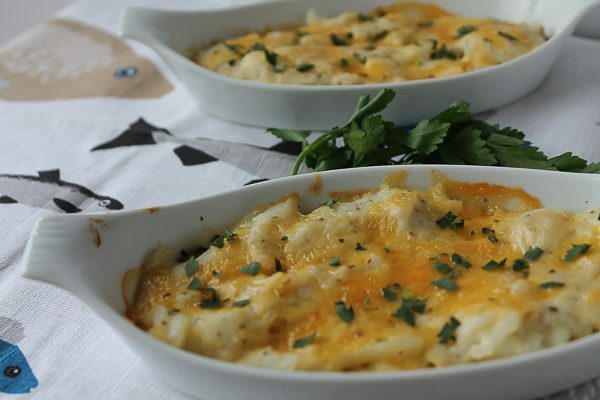 Arrange cooked and flaked fish in the baking dish, or divide between 6 gratin dishes; set aside. Melt the 3 Tablespoons butter in a medium saucepan over medium heat. Stir in flour, salt, savory or marjoram, and pepper. Cook and stir 2 minutes. Gradually add milk. Cook, stirring constantly until mixture thickens, about 5 minutes. Pour sauce over fish; sprinkle with cheese. Bake, uncovered, until hot and bubbly, about 20-25 minutes. Sprinkle with chopped parsley and serve. I like to serve the fish with rice or orzo, and sauteed zucchini slices. * To cook the cod, line a large baking sheet with rimmed edges with nonstick foil. Place fish on foil. Bake at 400 degrees about 12-15 minutes or until cooked, and fish flakes easily. Lift pieces out of pan and place in colander to drain. The fish gets very watery when cooked, which is why it is cooked before baking into a casserole. Flake the fish with some large pieces, not finely flaked. I’ll have to try this soon. Hope you will like it, Pat! Sounds delicious. Will give it a try soon. And I love all the ‘grandma ideas’ that are popping into your head. Enjoy showering those precious granddaughters with all the love you can.